A few million years ago, a handoff took place along the coast of northwestern Mexico. The strip of land that forms Baja Mexico was passed from one of the plates that make up Earth’s crust to another. The handoff created a gap between Baja and the present-day Mexican coast. The gap filled with water, forming the Gulf of California. Baja originally belonged to the North American Plate, which includes most of Mexico and the United States. But about five million years ago, an underwater formation known as the Eastern Pacific Rise began cutting into the edge of the plate. The rise is a place where plates are moving apart, and molten rock is pushing up to form new crust. 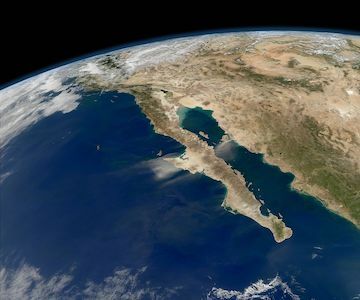 As the rise pushed up along the Mexican coast, Baja California split off and joined the Pacific Plate. Today, the Eastern Pacific Rise continues all the way under the Gulf of California, which is also known as the Sea of Cortez. The floor of the Gulf is crisscrossed by a network of fault lines and other volcanic structures. And molten rock beneath the sea floor heats pockets of water. Some of the water pushes up into the Gulf through hydrothermal vents -- jets of superheated water that contain a lot of dissolved minerals. The vents are home to teeming ecosystems of worms, fish, shellfish, and other creatures. Baja Mexico is still moving, as the Pacific Plate slides to the northwest. Millions of years in the future, it may break away from the North American mainland -- forming a giant island in the eastern Pacific.